Feeling like I was missing out on 'traditional' English breakfasts! When I was vegetarian, I enjoyed going to Cafés and ordering the 'traditional' English breakfast! Well...it was as close to traditional as it could be, without including any meat! I wasn't a proper vegetarian then, so I did eat eggs! :/ Nevertheless, after going vegan, I often reminisced about those days and wanted to re-live the experience. It was about more than the food, but the food was important! This was especially true when many Cafés didn't stock vegan sausages; so the breakfast wouldn't be a very filling one, or even close to 'traditional'! For a while we stopped looking and asking, but things changed. Related post explaining why I wasn't a proper vegetarian. It seems that a few Cafés do, or will, if asked; stock vegan sausages. We came across one in Ruislip which happened to use Linda McCartney sausages. They didn't call it a vegan breakfast but it was, so I was so chuffed! We sat and enjoyed a slap up 'traditional' vegan breakfast for the first time and it was great! If there's a Café that doesn't stock what you can/will eat, have a chat with them. They're often small businesses who want to please their customers. They also cherish regulars, so it's definitely it's worth a try if you want to eat there more often. We woke up wanting for a big breakie at home and guess what? It was easy to make! 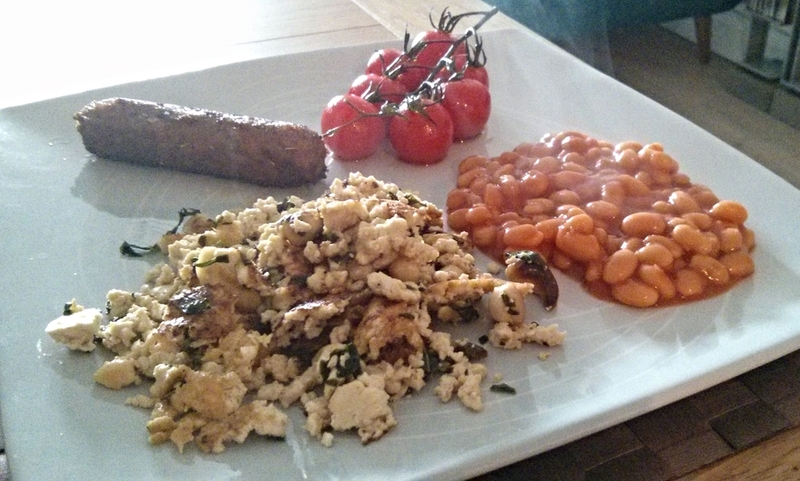 Scrambled tofu, sausages, beans and some vegetables. Doesn't it look good? Do you think you could make something similar? I don't feel like I miss out at all! I think it was much harder before; whereas now, there's a lot more awareness around diets, food choices and alternatives and the market is catering to our needs! Do you need to arm yourself with vegan recipes to make cooking easier and quicker? Do you have a block when it comes to cooking or knowing what to make? Have a look at these recipes. You may find one, which you didn't think could be veganised or you might spot one that will help you eat well without spending lots of time cooking. Of course, you may end up feeling that you're not missing out as well! "I've been vegan about two years. I used to miss cheese but now I make my own cheese sauce and there are some good commercial cheeses. I used to miss alfredo sauce but I learned you can mix cashews and macadamia nuts and make a rich sauce. I thougth I missed whip cream but then I found soya-too... I loved meatloaf sandwiches and then I discovered The Vegan Table cookbook. I tried some ricemallow this past weekend it was awesome... I'm still trying to think of what I really miss... I guess there's nothing I miss."